"This nanoformulation approach allows us to make vaccines against new diseases in only seven days, allowing the potential to deal with sudden outbreaks or make rapid modifications and improvements," says Daniel Anderson, an associate professor in MIT's Department of Chemical Engineering and a member of MIT's Koch Institute for Integrative Cancer Research and Institute for Medical Engineering and Science (IMES). Anderson is the senior author of a paper describing the new vaccines in the Proceedings of the National Academy of Sciences the week of July 4, 2016. The project was led by Jasdave Chahal, a postdoc at MIT's Whitehead Institute for Biomedical Research, and Omar Khan, a postdoc at the Koch Institute; both are the first authors of the paper. Most traditional vaccines consist of an inactivated form of a virus or other pathogen. These vaccines usually take a long time to manufacture, and for some diseases they are too risky. 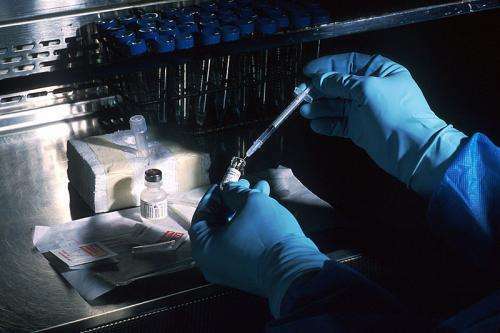 Other vaccines consist of proteins normally produced by the microbe, but these don't always induce a strong immune response, requiring researchers to seek an adjuvant (a chemical that enhances the response). The vaccine is designed to be delivered by intramuscular injection, making it easy to administer. Once the particles get into cells, the RNA is translated into proteins that are released and stimulate the immune system. Significantly, the vaccines were able to stimulate both arms of the immune system—a T cell response and an antibody response. In tests in mice, animals that received a single dose of one of the vaccines showed no symptoms following exposure to the real pathogen—Ebola, H1N1 influenza, or Toxoplasma gondii. "No matter what antigen we picked, we were able to drive the full antibody and T cell responses," Khan says. "The option of rapidly creating a completely synthetic formulation that can be effective as a vaccine is an important addition to currently available vaccine strategies," says Hidde Ploegh, an MIT professor of biology, a member of the Whitehead Institute, and an author of the paper, who added that it will be important to assess safety and cost. "Typically a vaccine becomes available long after the outbreak is over," Chahal says. "We think we can become interventional over the course of a real outbreak." They are also working on cancer vaccines. At a recent "Mission: Possible" competition hosted by the Koch Institute, Khan and Chahal were part of a team that ended up withdrawing from the competition because an outside funder, the Advanced Medical Research Foundation, offered to support them. "We are all excited about the potential of this new approach to provide a new way of vaccine delivery," says Robert Langer, the David H. Koch Institute Professor at MIT and an author of the paper. World-class stuff! What a boon if it turns out to be effective. Can we afford it, unless the government does it? This is great, if it's true. It makes me suspicious that it was released on the 4th of July and its 100% efficient. it says it's 100% effective "In tests in mice"
"This nanoformulation approach allows us to make vaccines against new diseases in only seven days, allowing the potential to deal with sudden outbreaks or make rapid modifications and improvements,"
This is great, if it's true. I agree with Captain Stumpy. Let's wait a bit. What is effective in a mouse model isn't necessarily effective in a human. The first stage is certainly promising. Now this has to go through the usual trial phases. But thanks to recent changes in legislature in some countries there are now 'fast-track' test regimes for potentially important medical applications. I am not sure, using mice or (most) any other animal will make much difference in it's effectiveness. I am thinking - this is a PROCEDURE for designing and making different vaccines not a specific vaccine itself, therefore it will probably work in people. Oh the procedure might need to be tweaked depending on the species but the science itself seems sound.